Washington, DC – On Tuesday, January 22, select Tenleytown restaurants will begin offering weekly discounts for local students and educators. Organized by Tenleytown Main Street, the “Tenley Tuesdays” promotion is aimed at Tenleytown’s extensive educational community. Students, teachers, administrators, and other school staff are eligible for the discount program. They simply need to show their current school ID to take advantage of participating restaurants’ promotions every Tuesday. Tenleytown is known for high-quality public and private educational institutions, ranging from pre-schools through post-secondary and law school. More than 24,000 students attend school within a mile of Tenleytown, a number that will continue to grow when Georgetown Day School completes construction of a new elementary and middle school adjacent to its current high school on Davenport St. Currently, Tenleytown is home to 11 schools, including pre-schools, elementary, middle, and high schools, American University, and the Washington College of Law. The pilot Tenley Tuesdays program will run through the end of the school year. Tenleytown Main Street anticipates more restaurants and retail businesses will join the program as it continues into the spring. Any Tenleytown business interested in participating may contact Tenleytown Main Street at 202-362-1815 or email info@tenleytownmainstreet.org. Crisp & Juicy, 4533 Wisconsin Ave: Buy any sandwich, get a free chicken sandwich from 2 to 5 pm. 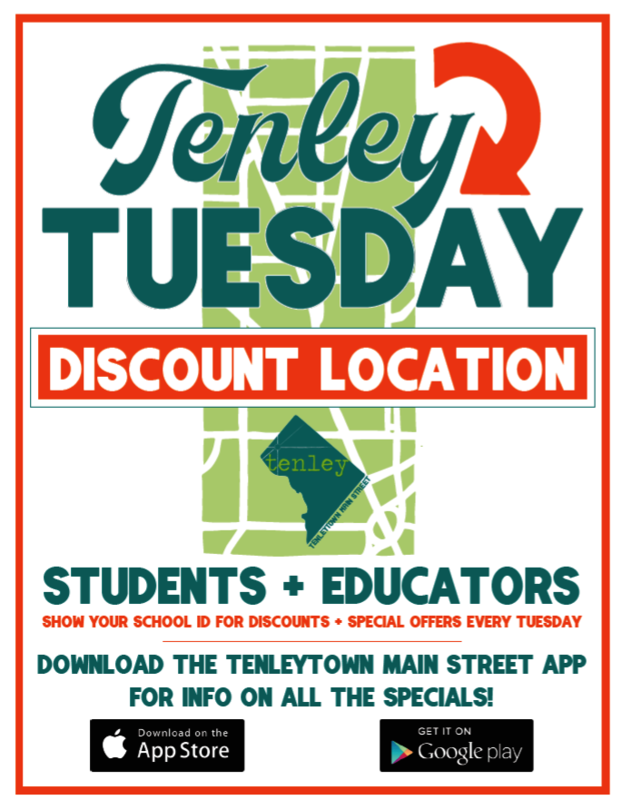 For an up-to-date list of Tenley Tuesdays offers, visit the Tenleytown Main Street website or download the free Tenleytown Main Street mobile app (available on Google Play and in the App Store). The app includes a searchable business directory, calendar of local events, and listing of area merchant specials.